Operating in high temperature environments calls for a more reliable heat resistant position sensor. Spectra Symbol’s HotPot potentiometer makes tracking movement in a volatile environment easier. It has a thin and sealed form factor that allows it to operate at temperatures ranging from -40°C to +85°C. This feature makes the HotPot an ideal position-sensing tool for industrial, military, and automotive applications. Design engineers choose this product because of its robust design and high life cycle output. Made from impregnated fiberglass material, the HotPot sednsor is highly resistant to temperature fluctuations. It operates either via an actuator or finger contact. OEMs and engineers prefer using this pot with a finger or stylus. attached to the shaft is a wiper that provides absolute position location. The ThinPot potentiometer is currently a medical standard for multinational companies such as Varian Oncology, Siemens, and Baxter Healthcare, while also being used in many industrial applications. 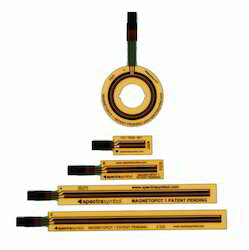 Spectra Symbol is a premier source for high quality linear position sensors Our line of linear sensors includes the ThinPot, a component that serves as a variable analog voltage divider. This membrane potentiometer measures 10mm wide and 0.5mm thick, making it ideal for applications in even the most difficult locations. It has all the features offered by the SoftPot, but is narrower. 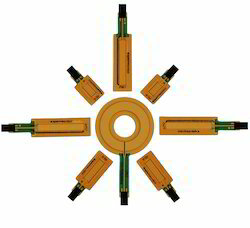 this sensor operates in linear or rotary configurations and is available in lengths of up to 2400mm. The MagnetoPot is simple, yet elegant in its ability to track motion in a contactless manner. A magnet on the inside of a cylinder, or on the other side of a motion device will guide the built-in magnetics of the MagnetoPot for position output as a voltage divider. As opposed to a Reed Switch, which gives simply “open” or “close” signals, the MagnetoPot gives the full linear travel as a magnetic sensor. 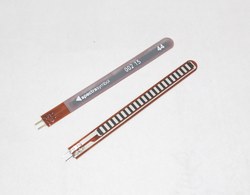 For the cost of a Reed Switch, the MagnetoPot offers tremendous sensing solutions for a fraction of other magnetic sensors costs. What position sensor can offer the magnetic characteristics of a reed switch with the output of a potentiometer, for the same cost of a Reed Switch? Only Spectra Symbol’s MagnetoPot. As a level sensor, both liquid level sensor and a magnetic potentiometer, the MagnetoPot will give linear feedback to position. For liquid level sensors, the MagnetoPot can attach to the outside of a liquid tank and give position of the magnet inside the float. No water ingress, no wearing of the part by environment, because the MagnetoPot is away from the activity. Hydraulic and Pneumatic cylinders typically have only end Reed Switches to control over-extension, but the MagnetoPot can offer much more than the end Reed Switches; it can give full-travel position sensing with magnetic forces through a potentiometer output. The SoftPot potentiometer is a linear sensing device used for tracking position and acquiring the preferred output in a variety of applications. 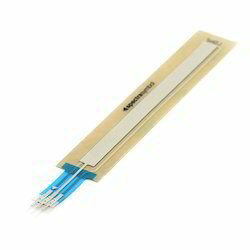 It comes in lengths from 10mm to 2000mm and offers a low form factor of less than 0.5mm, making it the thinnest linear sensor available today. The SoftPot works in multiple configurations, such as linear, serpentine, and elliptical. It operates in temperatures ranging from -45°C to 50°C and is ideal for products that need a sealed sensor with a tight form factor. It’s no wonder it became a popular option for clients in the medical, dental, and robotics industry. The SofPot is also a versatile sensor that can operate by human touch. It can provide the desired linear output regardless of the shape of the product it’s attached to. A simple Flex Sensor 4.5" in length. As the sensor is flexed, the resistance across the sensor increases. Patented technology by Spectra Symbol - they claim these sensors were used in the original Nintendo power glove. The resistance of the flex sensor changes when the metal pads are on the outside of the bend (text on inside of bend). Connector is 0.1" spaced and bread board friendly. Check datasheet for full specifications. 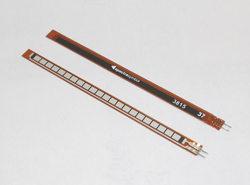 A simple Flex Sensor 2.2" in length. As the sensor is flexed, the resistance across the sensor increases. Patented technology by Spectra Symbol - they claim these sensors were used in the original Nintendo Power Glove. The resistance of the flex sensor changes when the metal pads are on the outside of the bend (text on inside of bend). Connector is 0.1" spaced and bread board friendly. Check datasheet for full specifications.